Michael represents injured workers and veterans in claims for Workers' Compensation, Veterans' Disability Compensation, and Social Security Disability/SSI. He received his B.A. from Dickinson College in 2004, where he majored in Political Science, and his law degree from the Duquesne University School of Law in 2007, where he served as President of the Student Bar Association. Since 2013 Mr. Quatrini has been a course planner and lecturer for the Pennsylvania Bar Institute, co-authoring and presenting statewide for "Advanced Issues in Social Security Disability" and "Social Security Disability: the Basics". Michael is a Past President of the Young Lawyers Division of the Westmoreland County Bar Association. In 2011, he was presented with the WBA's Outstanding Young Lawyer award. 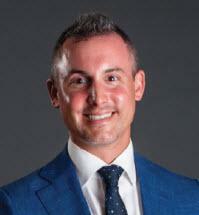 Since 2012 , Michael has been annually named a "Rising Star" by Super Lawyers Magazine, an honor given to no more than 2.5 percent of the lawyers in Pennsylvania. Michael is currently the Board President for Court Appointed Special Advocates (CASA) of Westmoreland County, Inc., serves as a board member for Westmoreland Cleanways (Recycling Coordinator for Westmoreland County), and serves on the Board of Directors of The Community Foundation of Westmoreland County. He is one of the co-founders of the "Visionaries," a group at the Community Foundation of Westmoreland County dedicated to educating individuals in their 20's, 30's, and 40's about community giving and foundations. Since 2010 the group has provided more than $25,000.00 in funding to local non-profits who develop unique programs to engage young individuals and encourage volunteering/board service. Separately, as Co-Chair of the Kid's Chance Golf Outing hosted by the Allegheny County Bar Association - Workers' Comp. Division, Michael has been instrumental in raising over $20,000.00 for Kid's Chance of Pennsylvania, a non-profit charged with providing scholarships to the children of injured workers. Michael and his wife, Megan, both grew up in Westmoreland County and currently live in the Point Breeze neighborhood of Pittsburgh with their beautiful (and talkative) daughter, Stella. When he is not practicing law, he enjoys biking, boating, golf, politics, and watching the Pittsburgh Steelers and Penguins. Honors: Appointed by the President of Duquesne University to serve on the "University Advisory Committee"